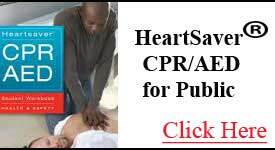 CPR St. Louis offers Basic Life Support (BLS or BCLS) class for healthcare providers to renew CPR Skills and learn the new American Heart Association (AHA) 2015 updates. 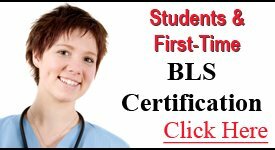 Student or healthcare provider who needs first time BLS CPR (BCLS) certification. A CPR class in St. Louis in a non-stressful and supportive environment. CPR St. Louis offers Pediatric Advanced Life Support (PALS) Classes, like all of our CPR courses, are American Heart Association certified. This course focuses on pediatric emergencies. 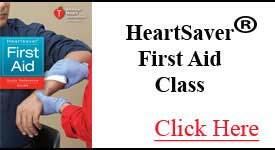 HeartSaver First Aid Class is for the general public. 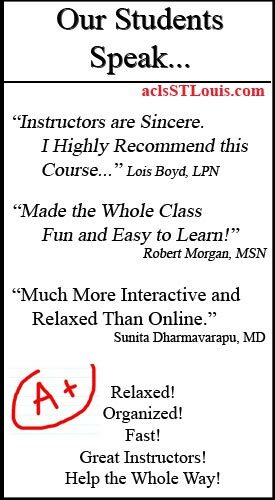 You will learn how to take emergency action for broken bones, sprains, strokes, bites, wound care, bleeding, blood sugar crisis, etc. Want an Online CPR Class? WE COME TO YOU! 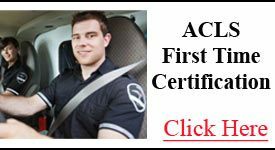 Here is the most convenient and cost effective way for medical, dental, surgery, etc offices to certify BLS and ACLS American Heart Association provider cards as a group. 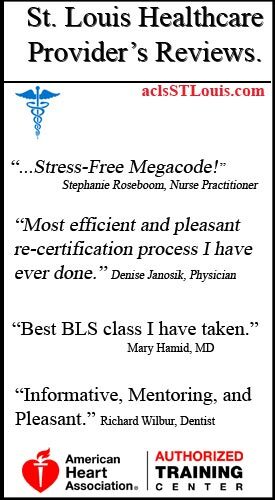 Fast, Convenient, and Stress-Free certifications at a discounted group rate. 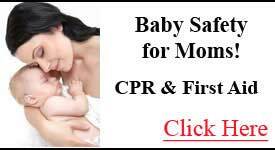 CPR and First Aid for Parents, Grandparents, Babysitter, Moms & Dads. "What Every New Mom Must Know!" In our Advance Cardiac Life Support renewal class, you will be in a stress free, relaxed learning environment that will allow you to effectively renew your skills, including CPR and megacodes. Our Advanced Cardiac Life Support 1st time certification class offers AHA training in a relaxed and stress-free setting. You will master life support skills, including CPR and megacodes. 1 DAY Pediatric Advanced Life Support certification class. Our PALS class is American Heart Association certified and designed to be completed in a single stress-free day. 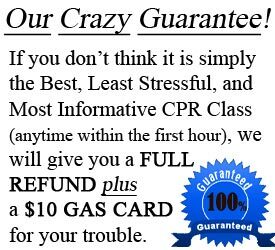 CPR and AED training for Personal Trainers, Lifeguards, Daycare Centers, Teachers, Coaches, Businesses, New Moms, Babysitters, etc. American Hear Association Heartsaver CPR-AED. BLS skills test, ACLS skills test, PALS skills test, HeartSaver CPR and First Aid. If you have taken the American Heart Association HeartCode® online BLS, ACLS, PALS, CPR or First Aid classes through an approved AHA online course, you still need an in-person AHA skills test check off to get your provider card. AED's For Sale! Special Offer Today. 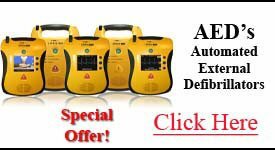 Choose from 3 AED Models and 3 Packages that Fit Your Automated External Defibrillator Needs. Special FREE Shipping, FREE AED Training and Discount on Future CPR and First Aid Training. Go Now! Always insure that the online class you buy is approved by the American Heart Association, as most online classes are not. In addition, most employers require an AHA approved provider card. Special Note:The American Heart Association does not approved any online cpr certification class as the sole means to become cpr certified. At minimum, there is always an in-person mandatory skills test required. 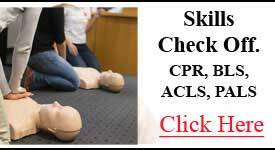 CPR St. Louis | ACLS, PALS and BLS Classes. Don't wait until it's too late. Get your healthcare provider AHA card renewed now! Even if you have an expired card, we can recertify you. You will receive your AHA provider card the same Day as Class! It's the easiest way to renew your CPR Certification in St. Louis. Question: Are you American Heart Association (AHA) accredited? Answer: Yes. CPR St. Louis is AHA accredit. Question: Is it possible to be issued an AHA approved Advanced Cardiac Life Support, Pediatric Advanced Life Support (PALS) or Basic Life Support card entirely online, i.e. 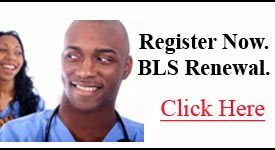 acls online or bls online? Answer: NO! Absolutely not! The American Heart Association does not approved any online course as the sole means to acquire an approved card. At minimum, there is always an in-person mandatory skills session required. 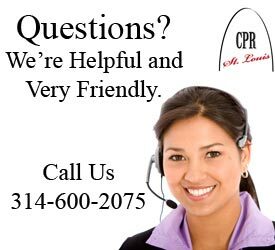 Question: In what areas does CPR St. Louis provide ACLS and BLS classes in St. Louis and PALS classes in St. Louis, MO? Answer: We provide classes for the following areas in Missouri: St. Louis County, St. Louis City, Jefferson County, St. Charles County, O'fallon, South County, Mehlville, Webster Groves, Clayton, Frontenac, Town and Country, Ferguson, Florissant, Overland, Maryland Heights, Wentzville, Wing Haven, St. Peters, and many more. We also serve certain counties in Illinois such as Fairview Heights, Belleville, St.Clair, O'fallon, Columbia, and others. If your area is not listed simply call us or email us. One of our professionals will be happy to assist you with your inquiry. Question: Will I receive an American Heart Association card? Answer: Yes. Our instructors are American Heart Association Instructors and all course material is developed by the American Heart Association. Not only do you receive a two year American Heart Association provider card, your records of course completion and certification are held at an American Heart Association certified training center. If your card is lost or stolen contact us regarding how to replace your card. Caution! Beware of companies that offer cpr certification online. Often they are not accredited with the American Heart Association and therefore cannot give the AHA Provider Card for any CPR certification. This means that most hospitals and other medical facilities will not accept or acknowledge cards from these sites. Hospitals and facilities in St. Louis require AHA CPR certification, St. Louis. Question: What if I am unable to attend one of the already scheduled classes in St. Louis because of a busy schedule? Answer: This is a common problem for healthcare professionals. Busy schedules make it difficult to fit everyone's needs. 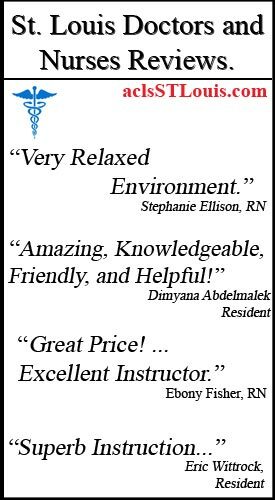 Because of this our AHA instructors provide private classes in St. Louis and the surrounding areas. This is a popular choice for St. Louis surgery centers, dental groups, doctors offices, and busy healthcare providers. Simply call our office with dates and times that work for you. Our professionals will assist you in registering for a private one-on-one class. Question: When should I expect to receive my American Heart Association certified provider card? Answer: : The same day as your class. We understand that busy healthcare providers sometimes forget about their renewals. Because of this and the limited time allowed to show proof to employers (i.e. your AHA provider card), we will provide you with your card the same day as class. Question: What is the size of the typical class? Answer: Our already scheduled classes are limited to smaller groups because of time, space, and a desire to provide focus on individual healthcare provider skill sets and expertise. Our online registration for these classes notifies our customers when an already scheduled class has been filled. Question: Do I need a student AHA manual? Answer: Yes, the American Heart Association requires that every student has access to an AHA manual before, during and after class. Question: What AHA courses do you offer? Answer: We offer Basic Life Support, Advanced Cardiac Life Support, Pediatric Advanced Life Support, PEARS, ECG-Pharmacology, HeartSaver CPR, and HeartSaver First Aid. Answer: Our website accepts secure online registration for our already scheduled classes in St.Louis and the surrounding areas. You can also register by contacting our office at 314.600.2075. 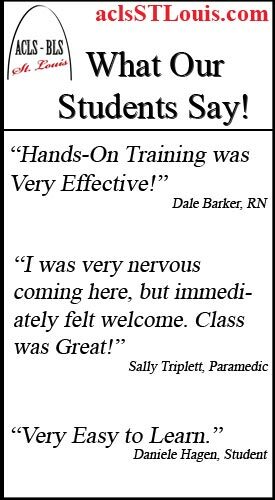 Our goal is to offer the best CPR Certification St. Louis has to offer! If you or your medical group want to schedule a private one-on-one or group session for recertification, please contact our office with dates and times that are convenient for you. We will help you register and make sure we can accommodate all of your specific needs. To schedule now please call our office at 314.600.2075 or email us at info@aclsstlouis.com. 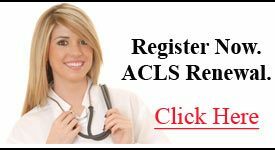 Question: Can I take my ACLS recertification class and BLS recertification class at the same time? Answer: Yes. Healthcare providers who need to take both classes can either sign up for one of the already scheduled combo classes or contact our office at 314.600.2075 to schedule an individual or group private class. Question: Do you offer CPR and First Aid for non-healthcare professionals? Answer: Yes. We offer the American Heart Association HeartSaver CPR and HeartSaver First Aid courses for personal trainers, teachers, coaches, life guards, childcare facilities, parents, and anyone else interested in learning CPR/AED and First Aid. Guaranteed Satisfaction. Guaranteed Secure Registration!